Here at Southport Carpet Centre, we supply carpets, rugs, laminate & vinyl flooring to homes throughout the North West – just take a look at this gorgeous bespoke carpet we recently fitted in West Lancs as an example! But it’s not just bespoke carpets, we have some incredible whole house deals waiting for you if you’re moving into one of the many new developments in the area. Top Tip: Don’t accept the builder’s offer to carpet your house, negotiate a price discount and then come to us where you can choose a quality, design & colour that you want for your new home. With over 25,000 lines of flooring to choose from, you’ll get the very best in service, price & some great advice. Leave the bricks to the builder and the carpets to us! There’s housing developments going on all over Merseyside & West Lancs, so in no particular order, here’s a few that are local to our showroom. New developments do cause upheaval & controversy in their local communities and we understand that, after all, we all live in the area too but all we ask is the opportunity to talk to you about carpets for your new home in Sefton, Merseyside or West Lancashire. Based on the former site of WCF Distribution, better known to older residents as Harry Hague’s where generations of lorry drivers learnt their craft, this Taylor Wimpey Development is nestled between the Leeds Liverpool canal and Briars Lane, the A5209, wending its way from the A59 on the South side of Burscough, through Lathom and over Parbold Hill on its way to meet the M6 Motorway at Junction 27 making this a great location for those that love the rural life but need to travel for work or pleasure. Burscough itself is a bustling town situated on the A59 which runs between Liverpool & Preston (and then onwards to the Pennines). Travelling through Ormskirk northwards brings the traveller into Burscough ‘Village’, renowned for its twin canal & railway bridges. Burscough itself was the site of the former HMS Ringtail, a naval aviation base during the war – now the site of a significant industrial & trading estate. There’s a good selection of local & artisan shops trading in the shadow of a relatively recent Tesco Supermarket and the art, retail & leisure experience of Burscough Wharf. The Grange at Yew Tree Park is a new development by Redrow. Located just to the south of the village and running adjacent to the A59 & Higgins Lane, this major development will feature 2, 3 and 4 bedroom homes and is within easy reach of Ormskirk, Liverpool & Preston. Speaking of Ormskirk, there’s plenty of new developments going on in & around this busy market town, now known as much for its student population as the still-famous gingerbread! 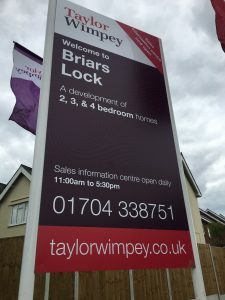 Highgrove Park is another Taylor Wimpey site, this time located on the A59 just as the road turns rural on the outskirts of Ormskirk at the start of the ‘long mile’ heading towards the Booths roundabout at Burscough. And closer still to our showroom, there’s the David Wilson Homes Pavilion Gardens site at Kew that you’ll pass if you head into Southport from the Ormskirk direction. Ideally located only a couple of miles from Southport’s railway station and within easy reach of the promenade, Victorian era genteel shopping canopies along Lord Street and the miles of beach, infamous for lack of water! No matter what size house you’re looking for, we can heartily recommend Sefton & West Lancs as a lovely place to work, play & live. Don’t forget to pop into our huge showroom on Eastbank Street in Southport and ask about our whole house superdeals, including underlay! Need some more information? Want to book a free quote? Whatever space you spend your time in, the right floor covering makes all the difference to how it makes you feel and here at Southport Carpet Centre, we've decades of experience in helping you find carpets, rugs & floor coverings that complement your home or workplace to make your living & working space comfortable, luxurious and matched to your personality. We're stockists for all the manufacturers you'd expect, and a few more besides. We stock, install & help refurbish Karndean & Amtico flooring and our skilled fitters won't leave until they're happy with the fitting service you've received. Whether a floor needs preparation, screeding or other works, we'll do whatever's needed to make fantastic flooring a feature of your home. It's not just homes though, our contract flooring teams work throughout the UK installing flooring in offices, shops, dental surgeries, nursing homes and many more commercial premises who benefit from our experience and access to thousands of different floor coverings. Southport Carpet & Flooring Centre is a family run business at the heart of Southport and our fitting teams are regularly seen throughout Liverpool, Ainsdale, Burscough, Preston, Ormskirk and wider afield too! Much of our business comes from referrals & testimonials, you'll see many on the site but do feel free to pop into our showroom at 99-109 Eastbank Street, Southport and see some original thank-you & testimonials we've received and we'll be happy to talk about your plans, friendly advice always & never any pressure. We're proud of our reputation gained supplying carpets to homes & businesses throughout Merseyside, West Lancs & indeed, nationwide, for decades and are delighted to showcase our commitment to quality & service through our entry in the Which? Trusted Traders Scheme. Moving to a new development in the Merseyside or West Lancs area? We'd love to quote you a special whole house superdeal. Take a look inside Southport Carpet Centre with our recent video or to really check out the fantastic range, take Google’s inside look at our showroom. We’ve got a great choice of natural wood flooring, easy-fit laminates and carpets of every description. There’s rugs of every size & shape with ranges to suit all tastes and our fabulous make-me-a-rug service where you can design your own! We stock all the leading brands you’d expect & more besides. From a welcome mat to a complete house deal, come along to Southport Carpet Centre on Eastbank Street! For hardwearing, commercial flooring, the Contracts team at Southport Carpet Centre are here to help throughout the UK. From high traffic office carpeting through to specialised easy-clean vinyl flooring for medical centres & surgeries you can be sure of the right product, professionally fitted and on-budget from Southport Carpet & Flooring Centre. 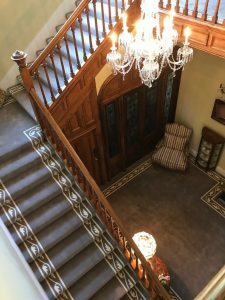 Suppliers of quality floorings to fit all budgets · Karndean · Amtico · Brintons · Alternative Flooring Co · Ulster Carpets · Abingdon · Tedd Todd & more. Where we cannot resolve any complaints using our own complaints procedure [click here], as a Which? Trusted Trader we use Ombudsman Services Ltd for dispute resolution. In the unlikely event of a complaint arising and you wish to refer the complaint to them please contact Which? Trusted Traders in the first instance on 0117 981 2929.